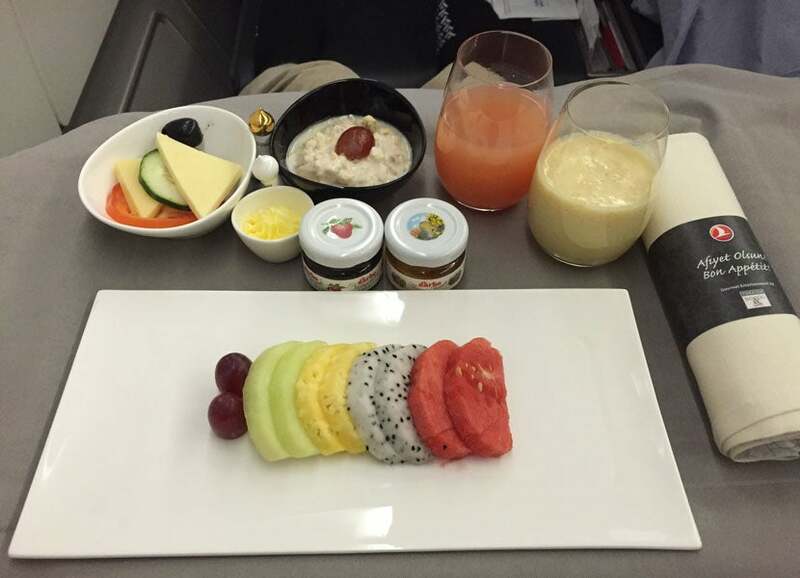 TPG Contributor Nicholas du Pont recently flew on Turkish Airlines’ A330-300 from Singapore to Istanbul, then on to New York. Read on for his impressions of the business-class experience. (All photos are by the author). My goal was to book a round-trip ticket from the US to Asia with a stopover in Europe — what better way to do it than by booking Turkish Airlines for my trip from Singapore to Istanbul and New York onboard the A330-300! From swanky seats to vast in-flight entertainment options, here’s my review of the carrier’s business-class product. I knew from previous experience that the ANA Mileage Club has zonal, seasonal and distance-based award redemption levels and that it partners with American Express, meaning that you can transfer Amex Membership Rewards points to ANA, earned with cards like The Platinum Card from American Express and Premier Rewards Gold. The only catch is you must book ANA awards through the airline’s call center, unless you are booking a straightforward one-way or round-trip flight. While this sounds like a hassle, I have found that ANA’s staff have often been able to get me award seats on flights that did not show any availability on United.com or Lufthansa.com, so bravo, ANA! As with United, even if the itinerary has mixed cabins, the total charged is for the highest cabin of service used, even if just for one leg. In the end, I ended up paying 115,000 ANA miles for a business-class, round-trip itinerary from the US to Asia that included a stop in Europe. While ANA’s website is quite clear about stopover lengths in Japan when using ANA for redemptions (anything under 24 hours is considered a layover, not a stopover, and has different rules) it was fuzzier when it came to partner awards. Again, a simple phone call to their service center confirmed that I could indeed make a longer stop in Europe. The Turkish Airlines check-in row at SIN’s Terminal 1. 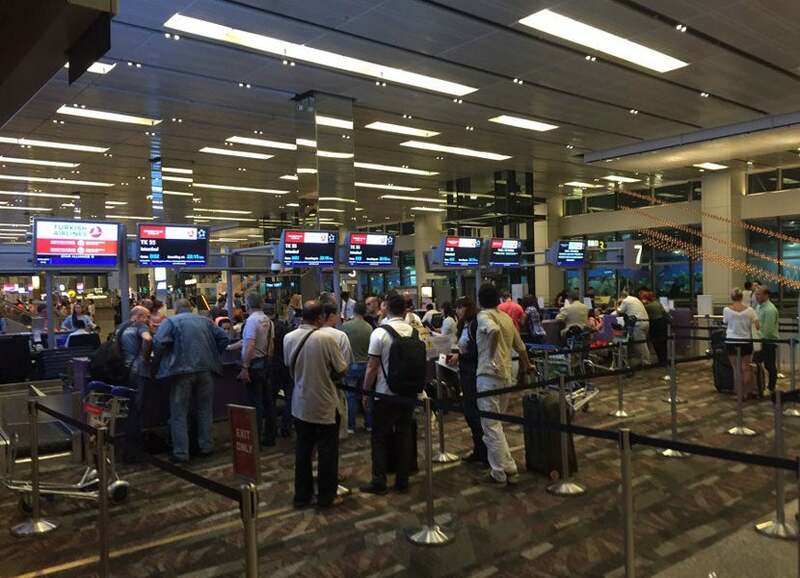 Check-in for Turkish Airlines at Singapore’s Changi Airport (SIN) is in Terminal 1. Business-class passengers can use the dedicated counter for business class in row 7 or the dedicated business-class check-in lounge, a shared facility used by a number of airlines operating out of Terminal 1. I opted to use the counter at row 7 since there was no line at the time. Within two minutes, my baggage had been checked through to New York, I received my lounge invitation and boarding pass and was on my way to immigration — Singaporean efficiency at its finest. I made my way to the SATS Premier Lounge in Terminal 1, a multi-airline lounge operated by Singaporean handling company SATS. The lounge was not excessively big nor was it crowded. It offered some hot and cold food options and a decent self-serve bar, but the one big drawback (in my opinion) was the lack of Champagne. 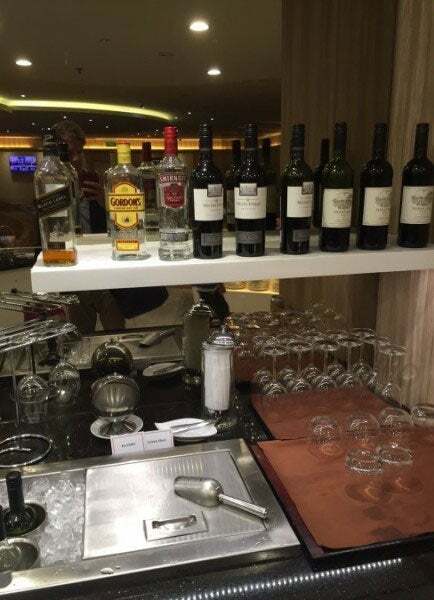 The limited self-serve bar in side the T1 SATS Premier Lounge. That said, the lounge did offer massive chairs that provided a full-body massage on par with what you’d experience in a spa — you can choose from two menus of pre-programmed massages designed to help travelers destress. There were a number of outlets around so you could charge your devices and a small table to perch your glass of wine on while you get rubbed, poked and prodded from here to heaven and back. 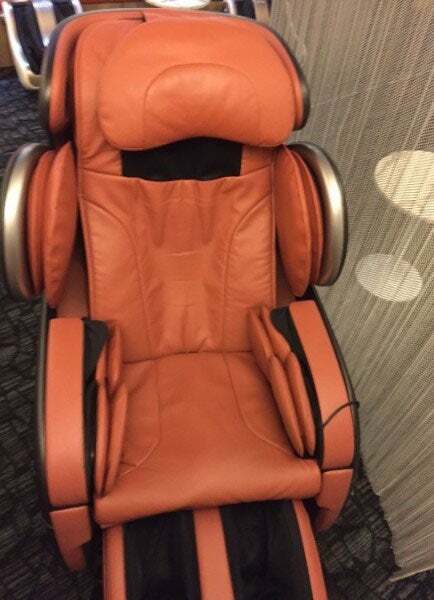 One of the five luxurious massage chairs in the SATS Premier Lounge. I’m a huge fan of the pre-flight Champagne, so I headed over to Singapore Airlines’ SilverKris lounge. There is one in Terminal 2 and another in Terminal 3, each about a five-minute trip from the SATS Premier Lounge using the airport’s efficient shuttle system. As a business-class passenger on Turkish Airlines, you have access to any of the Star Alliance-operated lounges in the airport, and being Singapore Airlines’ hub, the SilverKris Lounge seemed like the obvious choice. 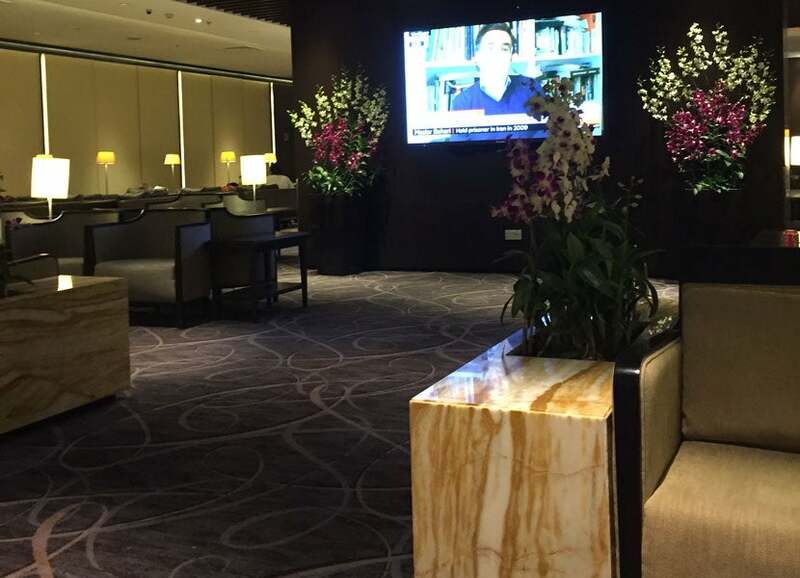 The SilverKris Lounge in Terminal 2 was quite large, with ample seating areas, soft music playing in the background and orchids discreetly placed throughout the lounge creating fantastic pre-flight ambiance. The seating area in the T2 SilverKris Lounge, a huge step up from the SATS Lounge! I poured myself a glass of Champagne and sat down with a copy of The Straits Times from the press stand. Just as my flight began boarding, a lounge attendant came over, addressed me by name, pointed out that my flight was boarding from Terminal 1 and suggested that I head over there shortly. Of course, I’d expect nothing less in a lounge operated by Singapore Airlines. 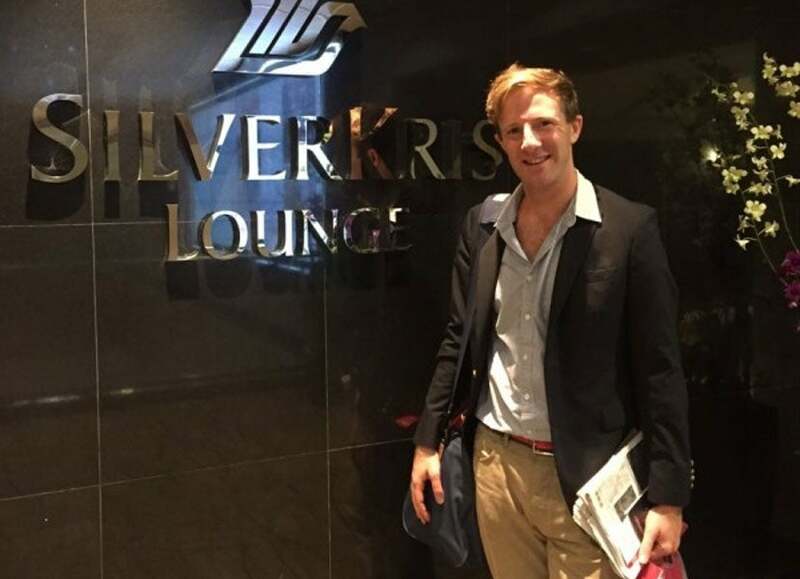 SQ’s SilverKris Lounge is a far cry from any of the other lounges at SIN. If you’re flying a Star Alliance carrier, head here! Sadly, this was all a stark contrast to my transit experience in Istanbul, where even the business-class line through security was thirty minutes long and left me with absolutely no time to visit the epic Turkish Airlines lounge in Istanbul. I will say, however, that boarding for my flight to JFK was done by zone. Despite that fact that 90% of the passengers ignored the “Please stay seated until your zone is called” announcement and got up anyway, the gate agents did enforce the business-class and Star Alliance Gold members board-first policy and turned many of my apparently deaf travel-mates away. 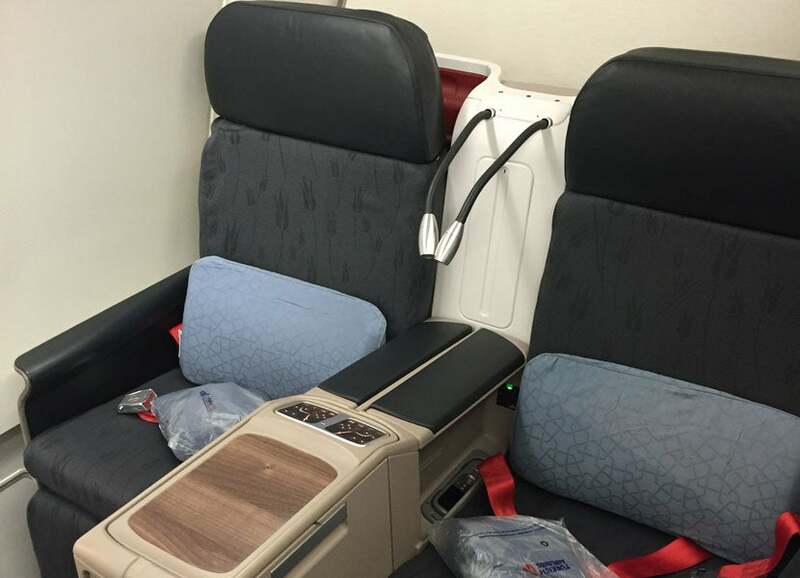 The business-class product on Turkish Airlines’ A330-300. By the time I got the boarding area, it was already mostly empty. I quickly cleared security, which is done at each gate individually at Changi, had my boarding pass scanned, made my way down the dedicated jetway for first and business-class passengers and boarded the new Airbus A330-300. The aircraft operating tonight’s flight to Istanbul was TC-JOG, an airplane that was delivered factory-fresh from Airbus about six months prior to my flight. Her sister aircraft, TC-JOA operated my flight to JFK, another factory-fresh airplane delivered straight to Turkish Airlines from Airbus in March of 2014. As a result, both planes still had a new, fresh feel to them. The A330-300’s business-class cabin was a huge contrast to the one on the A330-200, despite a similar 2-2-2 seating arrangement. The seat is completely different, too, since it is a true lie-flat seat compared to the angle-flat style you’ll find on the -200. 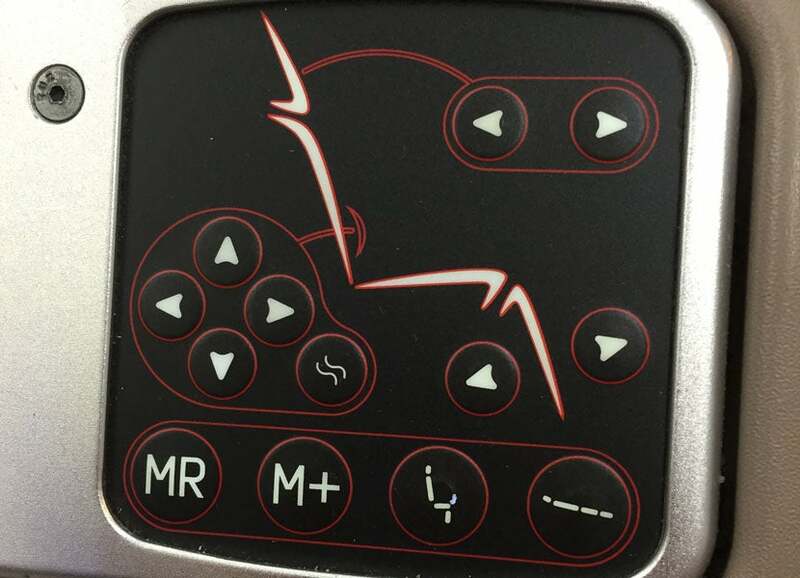 Controls for the lie-flat seat. The seat featured a universal power outlet and the armrest raised to become a divider, providing a little bit more privacy to solo travelers. 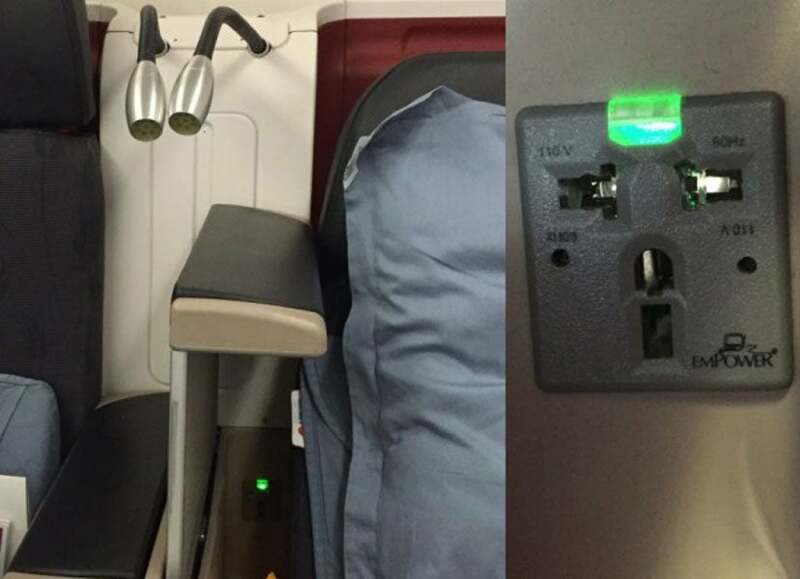 Turkish Airlines’ latest business-class seat features both power outlets and privacy screens. 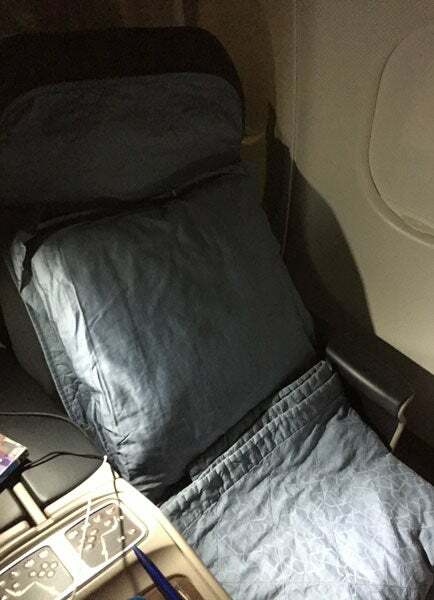 Leaving Singapore, the crew came through the cabin after takeoff to set up the beds in case people wanted to sleep, whereas this was only done on request after takeoff when I flew from Istanbul to New York — after breakfast was served, turndown service was offered to the remaining passengers who hadn’t already partaken. My seat after the turndown service. The illuminated red Turkish Airlines logo at the back of the plane (pictured at the top), set on a black background with a traditional Turkish design on it gives the cabin a cool, modern feel. The dark grey colors accented with red and deep blues contributed to the calm feel of the cabin. So far, I’m a huge fan. 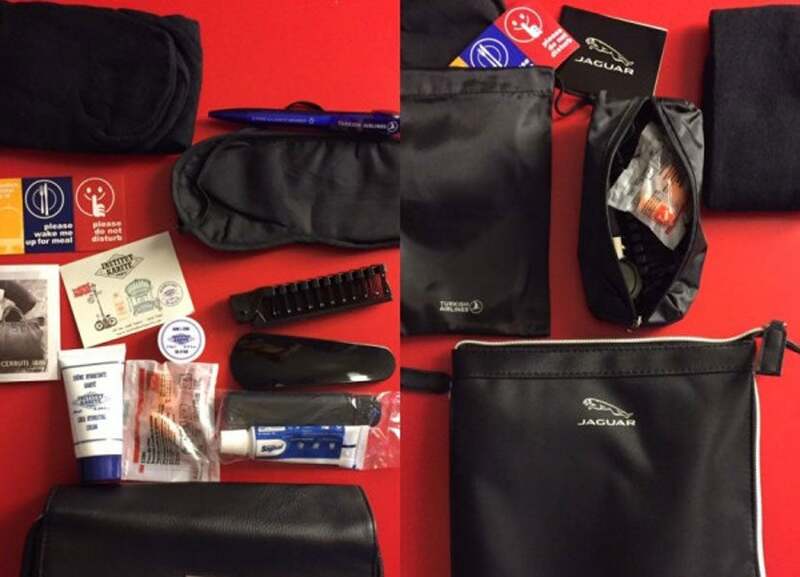 On the Singapore-Istanbul leg, Cerruti amenity kits filled with Institut Karité products were handed out, whereas on the Istanbul-New York leg, we were given amenity kits with Jaguar-branded items inside. The Cerruti amenity kits handed out from SIN to IST and Jaguar amenities from IST to JFK. We also received noise-canceling headphones. 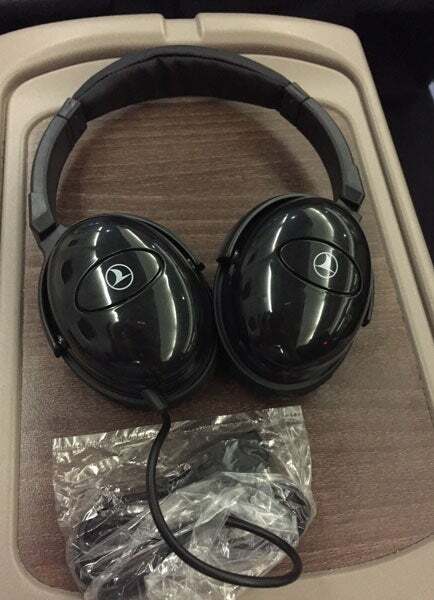 The noise-canceling headsets given out to business-class passengers. Once again, I was immediately approached with welcome drinks and addressed by name, a nice touch. 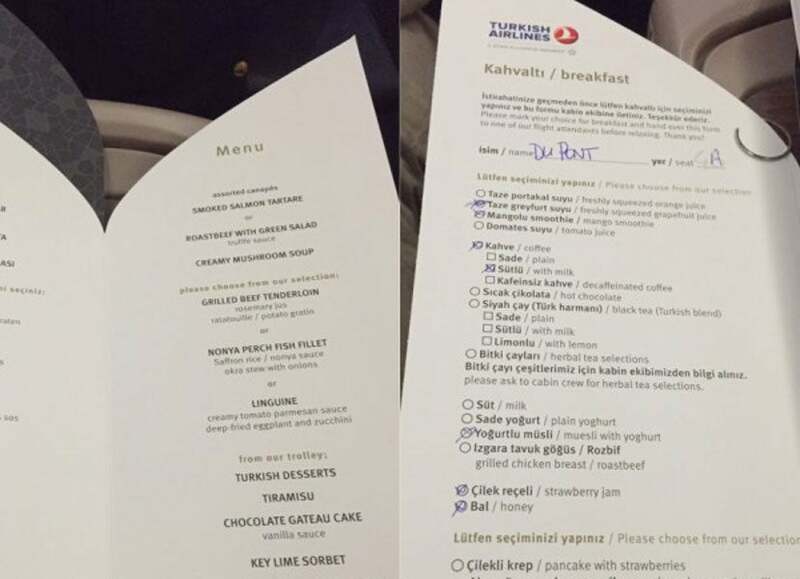 The chef then came by and on both flights, presented me with a personalized menu that detailed the dinner and breakfast options available on the Singapore-Istanbul leg, as well as breakfast and lunch on the Istanbul-New York leg. The dinner and breakfast menus on the SIN-IST leg. 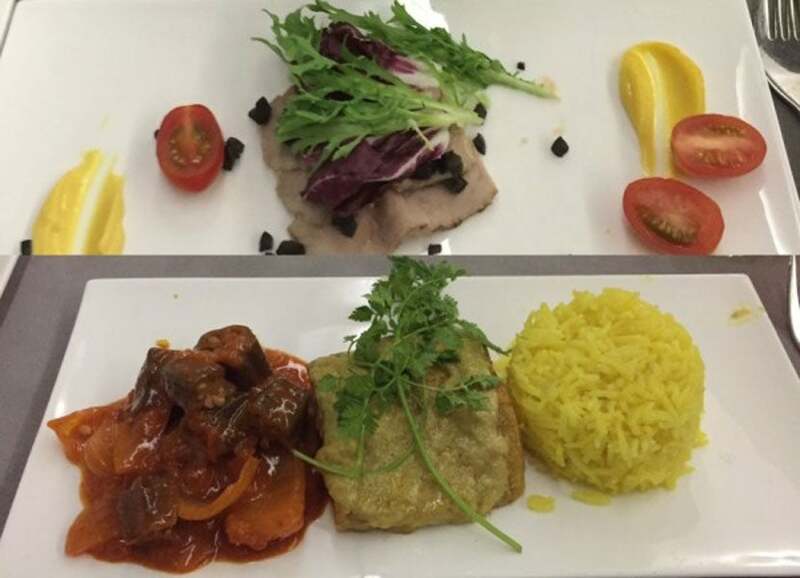 Out of Singapore, dinner was served promptly after takeoff. Turkish Airlines’ signature candlelight dinner set-up was placed on the table first, along with hors d’oeuvres and welcome drinks, followed by soup, salad and appetizers, the main course and finally dessert. The appetizer and main course served on the SIN-IST leg. Breakfast came around shortly before landing, and was again served personalized according to each passenger’s wishes. On the way to New York, the two services were reversed but done exactly the same way, with the same gracious service provided by Turkish Airlines’ flawless cabin crew. The starter tray served before landing on the SIN-IST leg. On both flights, I was addressed at all times by name by each member of the crew with whom I interacted — one of the pursers even noticed that my surname was French and asked in perfect French if I would prefer to speak French or English. Furthermore, my halting attempts to speak Turkish were met with enthusiasm and encouragement from crew members. While the hard product on the A330-300 was fantastic, it is the service provided that can really make or break an experience and as far as I’ve seen, this crew makes it every time. Welcome! 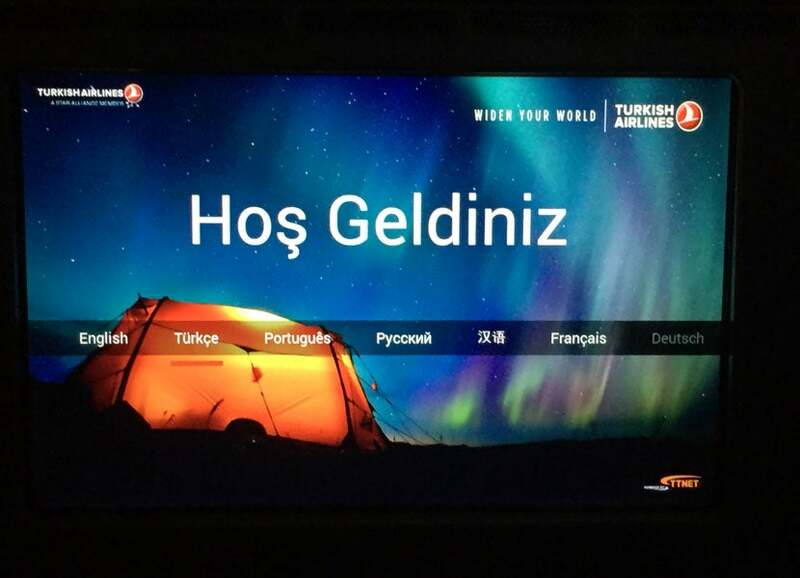 The language selection and welcome page on Turkish Airlines’ latest in-flight entertainment system. The A330-300 was equipped with the airline’s Planet digital entertainment system. The menu was easy to navigate and could be accessed through the handset or by touching the screen. Between movies, documentaries and TV shows, there were more than 350 options to chose from as well as games and music. The system allowed you to customize the audio and captions per your language for your movies as well, which was a nice addition. Our landing in Istanbul was early, but we parked at a remote stand and had to be bussed to the terminal which added quite a bit of time to the overall arrival process. There was a bus just for business-class passengers, however a few entitled individuals from economy ran over and piled on — and nobody from Turkish Airlines stopped them! — detracting from what had been a rather exclusive feel until that point. The transit area in Istanbul is nothing short of a mess at 6am, given all of the early-morning arrivals on Turkish Airlines. The ground staff there are not actually Turkish Airlines staff, but work for a handling company and are frankly not at all on the same level as the cabin crew. Our arrival at JFK was 20 minutes early. Some of the priority bags did come out first, however the majority came out intermingled with non-priority baggage and it took quite a while for my bag to appear — not necessarily the norm for Turkish Airlines, but certainly the norm at JFK. Turkish Airlines offers excellent value for your money and miles, especially when flying in business class on the A330-300s. The seats are comfortable, the food is second-to-none, and the cabin crew members were consistently top-notch. I will absolutely go out of my way to give Turkish Airlines my business again, and look forward to doing so. Istanbul’s Atatürk Airport (IST) is admittedly a bit of a mess, but the Turkish Airlines business-class lounge more than makes up for it, offering travelers an oasis in an otherwise chaotic, overcrowded hub.